Daily Messes: What Insurance Do I Need As A Parent? What Insurance Do I Need As A Parent? Everyone talks about home insurance, car insurance, and health insurance. But the other big one is LIFE insurance. I'm young..ish...in my early 30's. My kids aren't in grade school yet. Do I need life insurance? We're relatively healthy and aren't too risky (no sky diving for me, no sir). But for my peace of mind, we got a policy out last year through my husband's work. However, I still didn't really know what a parent should have so I called a couple of different insurance pros. I started with my local neighborhood agent who has dealt with my home and car insurance since I lived at home as a teenager. He didn't want to help. There are two main types of life insurance: term and permanent (also called whole life). I'm going to start with term life insurance. Term life insurance is the least expensive of the two. You pick a term, an amount of time, that you want the policy for (for example: 5 years, 10 years, 20 years). You pay your insurance premiums during that time, with the option to renew when the term is over. If something happens (i.e. death), your stated beneficiary will get a check for the amount of the policy. 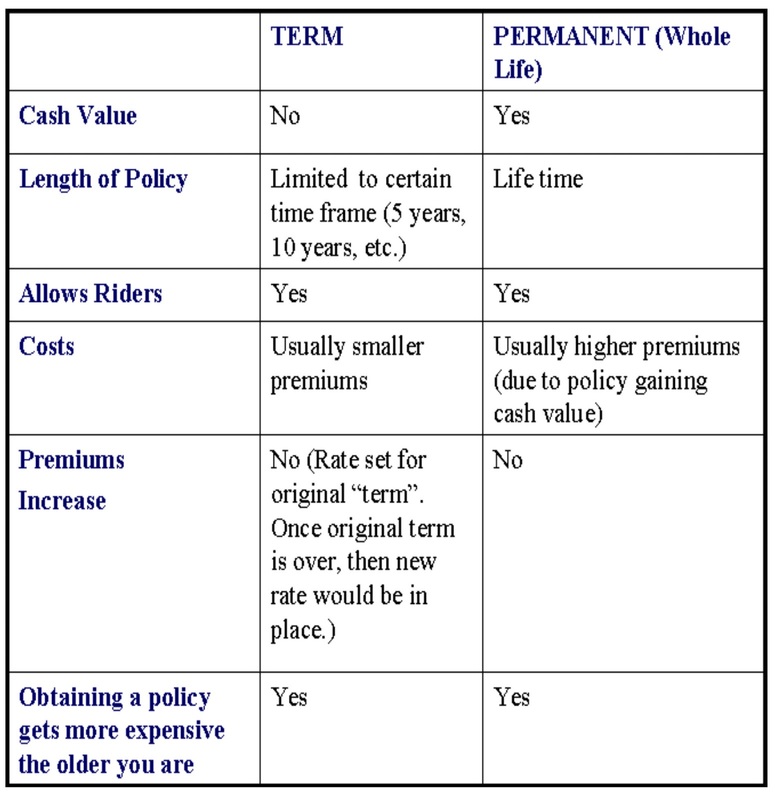 Term life insurance does not build a cash value. So if (God willing) nothing happens and the term expires without your renewing it, you do not get back any of your previous payments. Term life insurance also has a set payment rate (aka, premium) when you purchase the term; however, if you renew or get another policy down the road, you will have a new rate. Mike told me less than 1% of term insurance policies will pay out. Whole life insurance is a permanent type of life insurance, and is the more expensive option of the two. Your payment rates are based on the date when you obtain the policy, so the rates will not increase over the years (unlike term policies). Whole life also gains a cash value, so you can cash it out, withdraw from it, and even take a loan against it. Mike recommended having at least a $25,000 whole life insurance policy to cover your burial costs. He recommended State Farm and Guardian as good companies to look at for whole life insurance. Mike also recommended looking into riders for your insurance policies. Riders are different types of add-ons for your insurance policy that are available for an additional cost. There are many different kinds: a Return of Premium Rider will let you get the term policy premiums you paid back when the term expires. A Waiver of Premium Rider will maintain your insurance policy if you become disabled and cannot pay your insurance premiums. Some Waiver of Premium Riders will also cover if you are out of work. There are also child riders that allow you to add on your kids for smaller amounts. The Child Rider acts the same as a adult policy; if something horrific happens, you have the means to lay your child to rest. Once your children are adults, they can take the rider off your policy and start their own from that one. Mike listed the other benefits to getting a whole life insurance policy for your children: it's the cheapest rate (versus when they are adults, the rates will probably be higher), minimal restrictions, could take a loan against the policy for college while still maintaining the policy, guaranteed insurability (if, as adults, they take over the policy and opt for more coverage, they can do so without a health check), the rate would stay the same as when you purchased it when they take it over. In terms of other insurance, Mike also recommended health, car, and home or renters insurance. I learned something new about renters insurance! Renters insurance is not just about what is in your apartment/home. If your car is parked in the driveway or on the street outside your apartment/home and someone breaks into the car and steals "personal items" from the car, the renters or home insurance would cover the items taken. Car insurance would cover the damage done to the car during the break in. I next called Allstate (800-255-7828) and spoke to "Amy". Amy also stated that every adult needs life insurance, at least enough so that your family is not left behind with large bills to cover. Amy recommended starting with term, since it is it more affordable and to get what you need (for example, to cover your car payment, mortgage, other large bills, etc. in case something would happen to you). Amy stated that if you have younger children, to get a longer term policy (for example 20 years) to cover the majority of expenses while the children are at home. Once they are in college, you probably don't need as much (but maintain enough to cover any mortgage payments, car payments, and your burial). Allstate does offer life insurance. Their permanent (whole life) policy stays with you a lifetime as well, although they state a lifetime is 100 years. If you live past 100 years, they will send you a check for the policy amount. The Child Rider can also be attached to an adult policy through Allstate and provides life insurance for your children. You can add a child rider for children 17 years or younger and it will cover the child under your adult policy up until they are 24. Through Allstate, your (adult) child can take his/her rider off of yours and start their own policy. However, Allstate allows them to multiply the child rate up to 5 times for an adult policy. For example, if you had a $10,000 child policy, they would have the option to start at a $50,000 adult policy. The Child Rider also lets your child not worry about insurability/eligibility. If they are covered as a child under your policy they do not have to prove their eligibility; so if they have health problems (diabetes, cancer) as an adult (or if happened as a child while on the policy), they can still convert the Child Rider into an adult life insurance policy. I was also warned about getting life insurance policies through work. (Whoops.) I was told that your life insurance policy obtained through your work will not always go with you if you quit or are fired. (i.e. If you are fired, you no longer have a life insurance policy). She also told me that she has heard a lot of companies are only providing life insurance pay outs in the case of accidental death. (So if you die of a terminal illness or natural causes, the policy will not pay out to your family). Read your policy carefully! Amy recommended that you get a policy that is not at the top of your budget. The reason? If, for example, you are laid off and money is tight, you may have to choose between bills. You are probably going to choose to pay the heat/electric bill over the life insurance bill. She recommended picking a life insurance that will cover your expenses in case of a tragedy, but also picking one that you can continue paying. She recommended having car and health insurances, as well. Also, according to Allstate's website, life insurance benefits fall under death benefits and are usually exempt from federal taxes upon your death. However, they may still be taxed under income or Estate taxes. I talked to a representative from Met Life. She was supposed to email me information, but I haven't received anything yet. I know, that was super long and you probably just want the basics. Here they are: get some sort of life insurance for yourself, spouse, and maybe the kids, in case something happens. If you can afford a whole life policy, get one now to get a lower rate. Costs only go up as you get older. If you can afford to add your children on to your whole life policy, do so. If you have a policy through work, make sure to read it (if you are covered after termination of employment, when does it pay out, etc.) These are findings that I found out through internet research and phone conversations; however I'm not perfect, so make sure to ask your own questions! 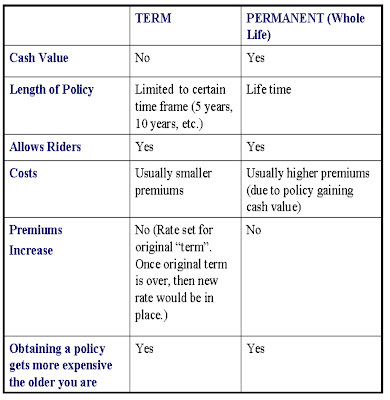 TERM LIFE INSURANCE: Insurance you can buy coverage for a specific length of time, or a "term". (Such as 5, 10, 15 or 20 years). Does not gain cash value. Rates stay the same during the original "term" of the policy. WHOLE LIFE INSURANCE: A permanent type of insurance that covers you for your lifetime. You lock in a rate the date you obtain the policy. Gains cash value that you can get access to. RIDER: An additional benefit or feature you can add to your insurance policy for an additional cost. INSURABILITY: Criteria you must meet to quality for coverage. Factors includes life expectancy, health, and risk factors. BENEFICIARY: The person(s) you designate to receive the policy's benefits (i.e. money) after your death. Life insurance is a daunting issue to many people because of the number of products available. To ease the process, seek the help of a trusted life insurance broker. He/she may be able to advise you on which type of plan would work for you best.